3 Idiots. One of the most awaited movies of the year. Its music is finally out. When a team like Vidhu Vinod Chopra, Rajkumar Hirani and Amir Khan is involved we can surely expect something different as far as music is concerned. 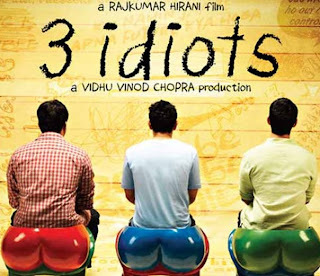 Music of 3 Idiots is composed by none other than Shantanu Moitra famous for his light, straight-from-the-heart melodious tunes. Moitra has taken heavily from Ravindra Sangeet. Anyway, moving on with the review, Lyrics of 3 idiots have been penned by Swanand Kirkire famous for his ‘Mann Ye Bawra’ lyrics. Kirkire’s writing is as fresh as morning dew and for a movie like 3 idiots the words chosen by him are very apt, young audience can connect to the songs very well. So here we go, album has 5 original songs and 2 remixes. 1. All Izz Well – Album opens up with ‘All Izz Well’. A very energetic number sung by Sonu Nigam, Swanand Kirkire and Shaan. The whistle in the song makes it more fun to listen. Lyrics are very catchy and the song is likable upon the very first listening itself. It has a remix version also. 2. Zoobi Doobi – A soft romantic number with a kind of liveliness that appeals to you despite the normal tune. Sonu Nigam & Shreya Ghoshal are once again great behind the mic. The only let down in this song are the average lyrics. This song also has a remix version. 3. Behti Hawa Sa Thha Wo – Sung by Shaan and Shantanu Moitra himself, this is a situational song(sung for Amir Khan’s character Rancho). A typical soft Shaan number, surely will be liked by all. Use of flute adds feathers to the melodious tune. 4. Give me some sunshine – Perhaps the best song of the album. This song has been sung by Suraj Jagan but the highlight of the song is the commentary by Sharman Joshi. A very, very fresh song. Listen to it as soon as you can for no words can describe the beauty of this masterpiece. 5. Jaane Nahin Denge Tujhe – Sung by Sonu Nigam this intense song is yet another jewel of this crown. The song kind of grows on you upon many hearings. Give it 3-4 listenings at least if you don't like the song initially. I'm sure you will like it. Final verdict, an album you cannot miss. Go for it definitely. !! sweet poem... which touches my heart..